Not surprisingly, popsicles are a huge hit in this house during the warmer months. 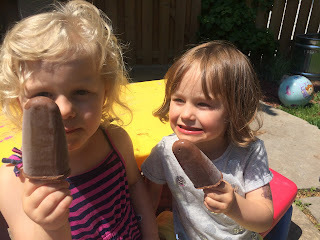 The girls and I have experimented with all sorts of different fruit popsicles. 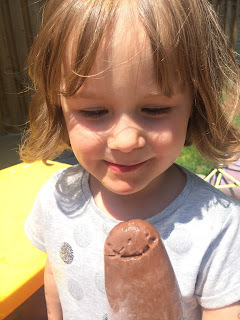 I thought that we should change it up and make fudgesicles this time. Apart from being extremely messy, they were a gobbled up in no time! I love making my own because it is so quick and easy, but also allows me to control what goes into them. Nutritionally, this recipe is good because it provides the kids some necessary fat from the coconut milk. With only some maple syrup in it, sugar crashes can be avoided! 1. Throw everything in the blender! No kidding, I was just looking for a homemade fudgecicle recipe this morning! This looks perfect, thank you!!! Let me know what your kids think of them if you do decide to make them!